The goal of honors math is a deep understanding of the concepts. It is great to be able to "do" the math, but the real goal is to understand and even be able to explain the concepts. When a student can explain and justify an answer or a process, it takes on a much deeper understanding. The beginning of a unit typically includes a pretest so that I can evaluate each child's level of understanding. From there, some of the lessons are personalized based on the needs of the students and the group. The idea is that each student is working at his/her own level. With standards based grading, each child is assessed often to show growth and improvement with each skill and concept. Those who have mastered the concept, are challenged with a "level 4" problem or project. There is always room to learn more! Third graders are learning the routines of honors math! They know prime numbers, composite numbers, factors, multiples, and divisibility rules. Practicing these skills in game settings makes learning even more engaging. 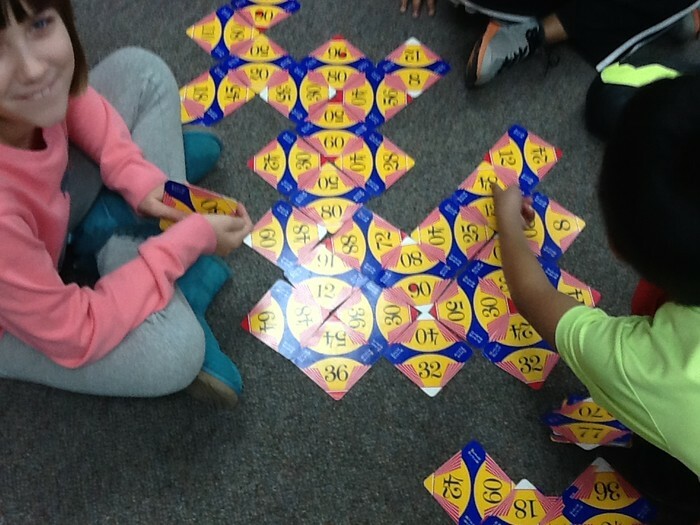 You can try these games at home by visiting https://calculationnation.nctm.org/ and playing "Factor Dazzle" or "Times Square." In class we play with students in pairs against the computer. 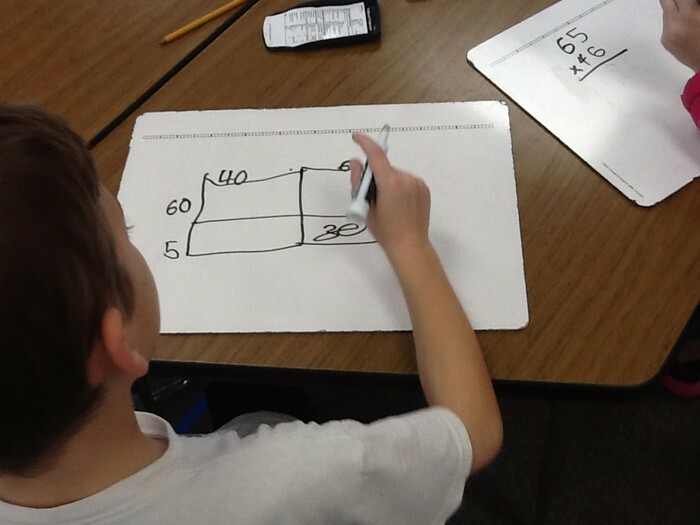 Students are using several strategies to multiply double digits by double digits. The area model is the most concrete way to practice this skill. Honors Math students are choosing the strategy that works best for them at this time. You'll notice the quiz coming home this week. Everyone met the target! 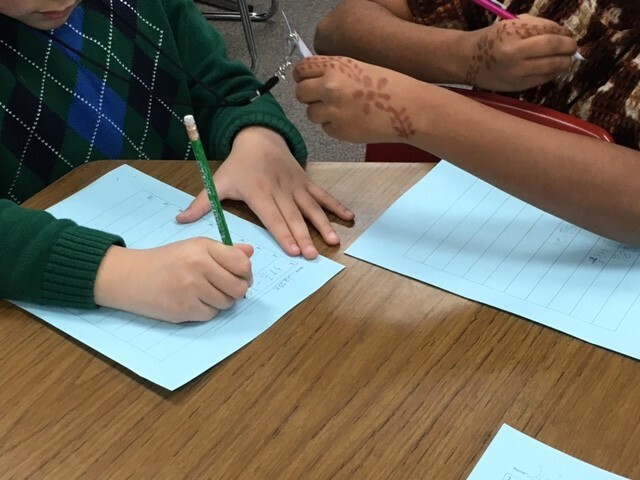 Ask your student if it is OK to "add a zero" when multiplying by 10. Be ready to listen to this new understanding. Division is next. Watch for new strategies and new understandings. 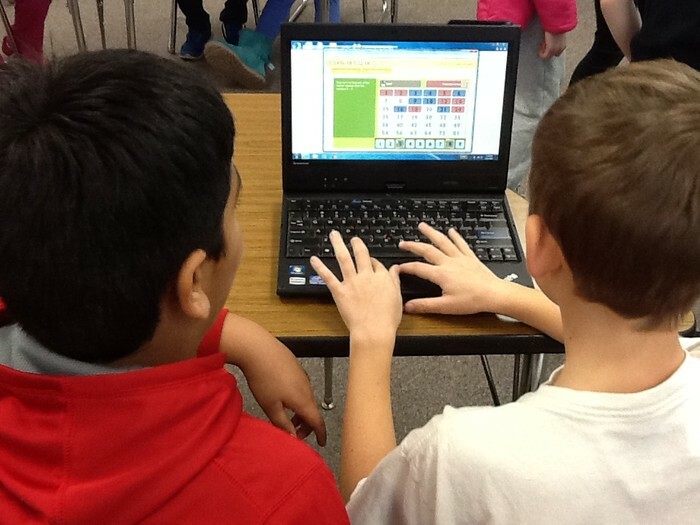 This might look like a game, but it's all about factors and multiples... and math talk. White boards are so handy for multiplying with the area model. 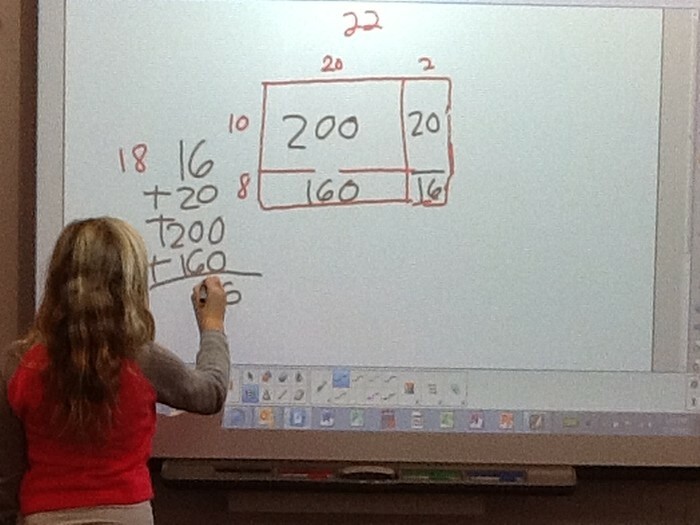 Students take turns at the SmartBoard using the area model for multiplication. 4th graders will continue solving problems with adding and subtracting mixed numbers in new settings such as word problems and pictures. Our goal is understanding, not just doing. Watch for those quizzes to come home soon. Everyone met the targets! 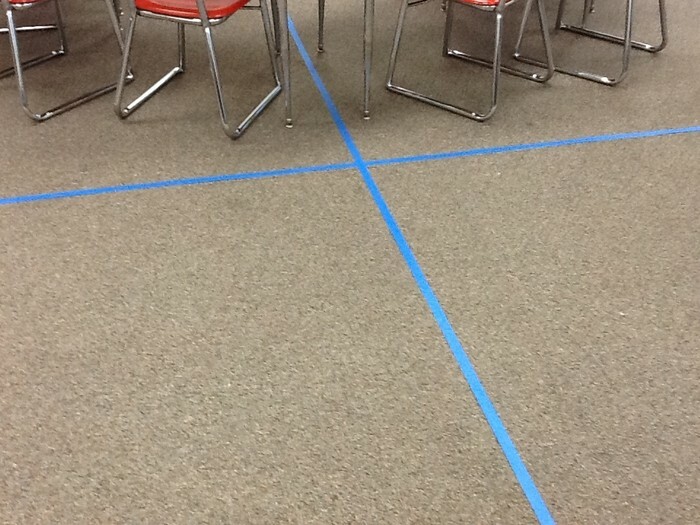 The coordinate plane is our next focus. 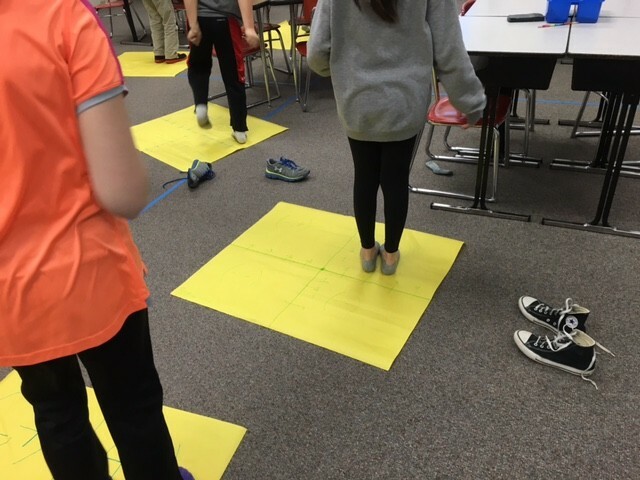 Ask your student about life on the plane - they are living in quadrants now ... and dancing on the coordinate plane mats they made. The best way to learn is through experience! Active learning at its finest! Working with a friend or small group extends understanding with any concept. Dancing in math class? 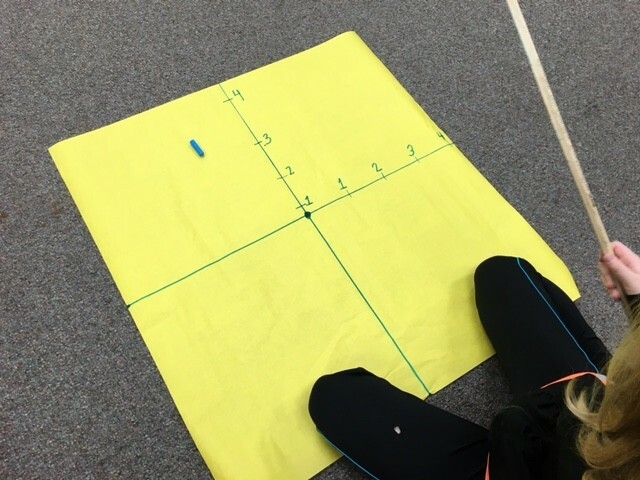 Students create the coordinate grid and then dance on it. 5th graders are working on ratios and proportions. These are 6th grade standards and provide the basis of proportional understanding. While they've had experience with this kind of problem solving, this is their first true instruction in ratios. 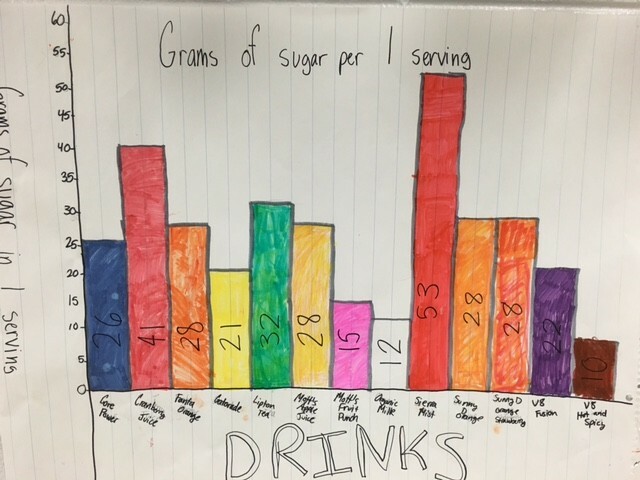 Do you know how much sugar is in your favorite beverages? Your fifth graders do! 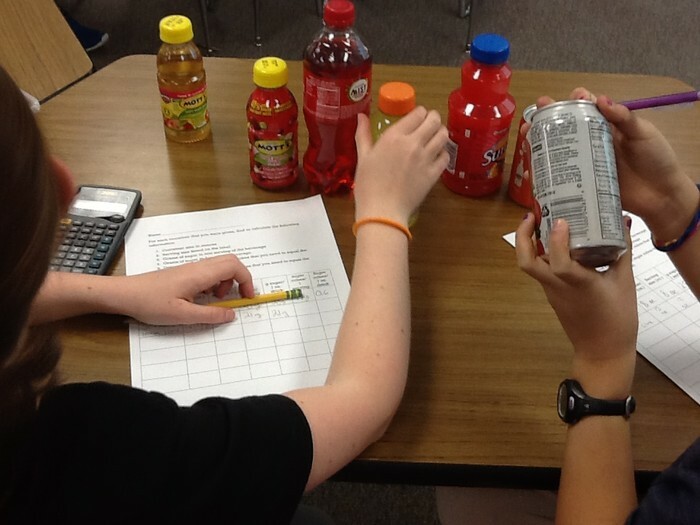 They completed a project where they calculated sugar per serving and sugar per ounce in several different popular beverages. 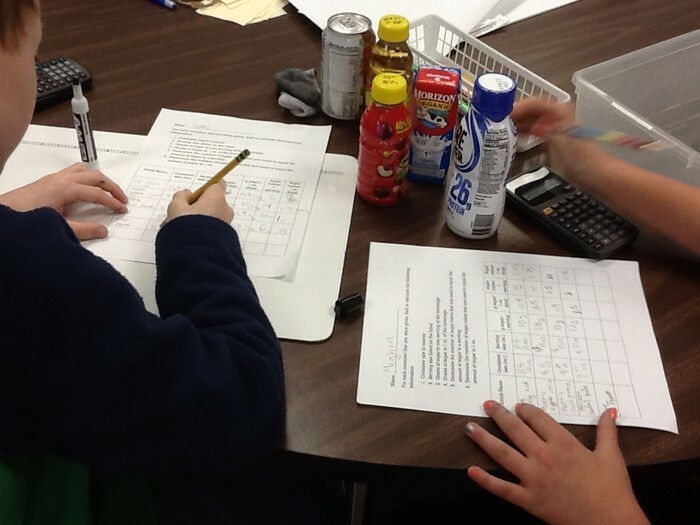 Then they calculated the sugar amount in the beverages and displayed that as sugar cubes. This project continued with graphing and then analyzing those graphs. Take a look at the graphs on our Canvas site (look in the "projects" section). You'll hear some of your favorite mathematicians describing those graphs. Watch for the quiz to come home this week. Everyone met the targets! This unit will continue with more real life examples of proportional thinking. Fifth graders are reviewing the coordinate plane by living on the plane these days. They created mats for the dance routine and are living on quadrants. It's the experience that helps them remember. What's the best way to present the data? Unit rates with sugar in beverages. 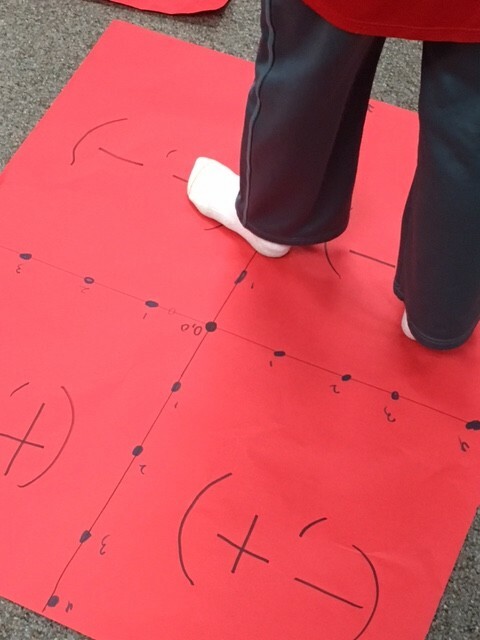 5th graders review coordinate geometry by dancing on their dance mats. Visit our class Canvas site often to see examples of your child's work as well as information from class. I've created a section for pictures and the weekly Kakooma results to show some of our favorite activities! I hope you enjoy the break with your families! Come back to school in January ready to learn more math! Please contact me with your ideas or concerns. We are partners in your child's education.